Home to one of London's most prestigious afternoon tea lounges, this luxury hotel transforms guests back into a bygone era of style and elegance. 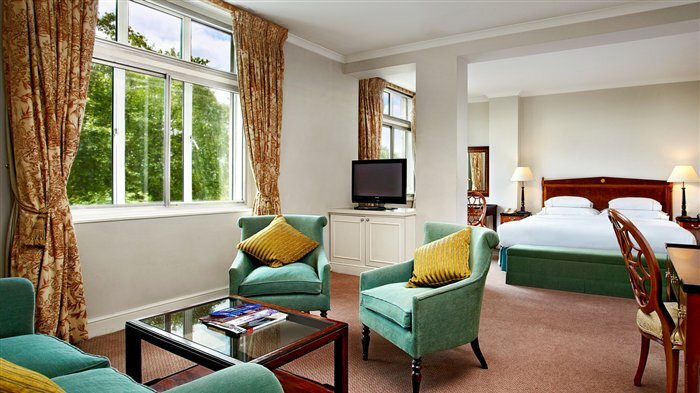 This hotel offers first-class comfort in one of London's most revered neighbourhoods. From the old-style art deco of Bracewells Restaurant and Palm Court to the swish contemporary character of Citrus Restaurant and Café, the public areas in this hotel are stunning. The hotel offers first-class comfort and service but with Green Park one way and the exclusive streets of Mayfair the other you'll be dying to get out and about. Afternoon tea is served in a grand art deco room. Awarded the Certificate of Excellence by TripAdvisor in 2014, The Palm Court at the Park Lane Hotel is one of London's most prestigious Afternoon Tea destinations. Located at the heart of the hotel, the beautiful art deco room transforms guests back in time to a bygone era of style and elegance. A grand arched glass ceiling creates a light, airy space, while a smart art deco bar at the end of the room completes the sophisticated décor. The Palm Court also boasts a resident harpist, offering soothing melodies throughout the day. The Park Lane Afternoon Tea offers a selection of finger sandwiches including roast beef with wasabi mayonnaise, roasted Scottish salmon with dill and lemon, and salt and pepper chicken with celery and mustard mayonnaise. Plus, a choice of scones with clotted cream and seasonal preserves, and a variety of tempting French pastries. There's also the option of The Art Deco Afternoon Tea, which is served with a glass of Moet & Chandon Brut Champagne. Breakfast, cocktails and an all-day menu are also available in The Palm Court. Traditional Italian dishes made with modern techniques. Serving both classic and modern Italian dishes, Citrus at The Park Lane Hotel is a casual restaurant that concentrates on fresh, lively flavours and ingredients. Traditional Italian dishes are made with modern techniques and flavours, with everything created in house. The menu features a range of antipasti, risotto, pasta and pizza, as well as a number of meat and fish dishes. Marble floors, leather banquettes and fresh colours create a Mediterranean feel and the outdoor area boasts a great view across Green Park, making it an ideal summer dining destination. From cheap budget accommodation to luxury 5 star hotels see our discounts for hotels, including Hilton London Islington Hotel from 68% off.